First of all, your computer must have graphics chipset with OpenGL hardware acceleration enabled. During this guide, I will setup this VirtualBox image on my HP mini 210 Ubuntu 12.04 Operating System. You'll need an Android x86 OVA file and buildroid_renderer package which can be download here. Install VirtualBox from Ubuntu Software Center. 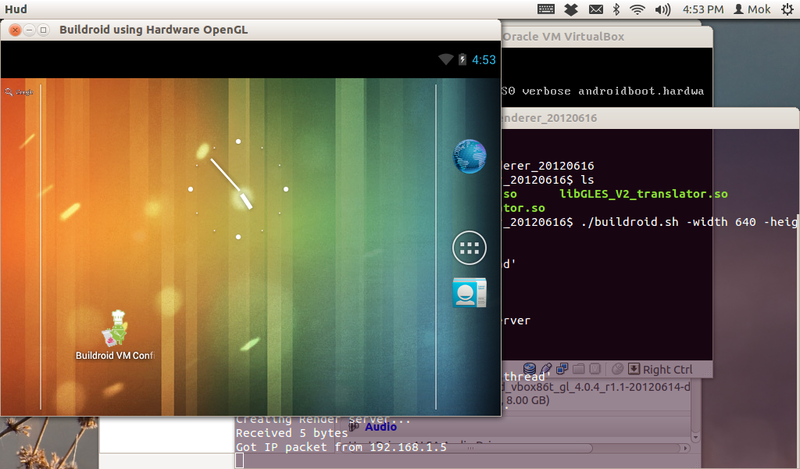 Open VirtualBox, click File > Import Appliance... to import the Android OVA. After import, don't start the Android Virtual Machine yet. If you already have libGL.so in /usr/lib/i386-linux-gnu/ directory, ignore this step. If you don't have it, please install libgl1-mesa-dev package (sudo apt-get install libgl1-mesa-dev) and you should have libGL.so in that directory. Open Terminal and navigate to buildroid_renderer package location and execute buildroid.sh (./buildroid.sh) and a blank window appear. 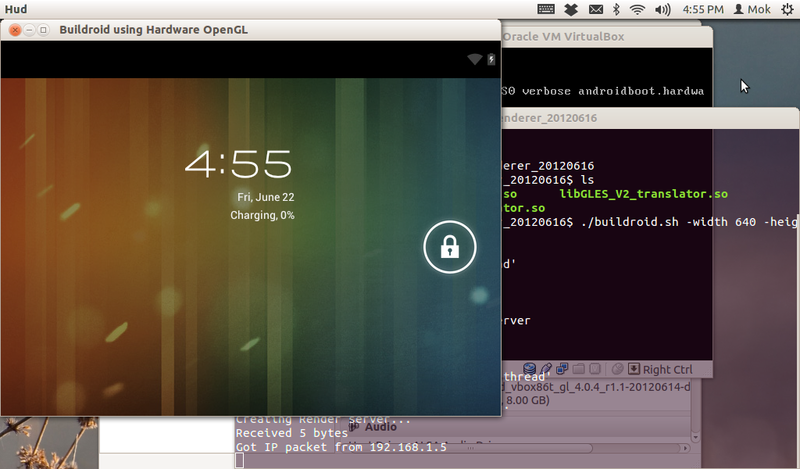 Now start your Android Virtual Machine in VirtualBox. Wait for awhile the blank window will show up the Android 4.0.4 ICS user interface. You can change the window size while executing buildroid.sh For example, ./buildroid.sh -width 640 -height 480 the window size will open in 640 x 480 size. is something like this possible in windows? It is possible. According to the creator, he have some performance problems on Windows version and working at it. I will update as soon as it is available.